Hello everyone, today I'm here with a pretty simple card featuring some stamp layering and water colouring with Altenew Inks. Lemme tell ya, these inks are amazing. I could probably get rid of almost any other dye ink pad I own and just be happy with these. I've had such a good experience with these inks! 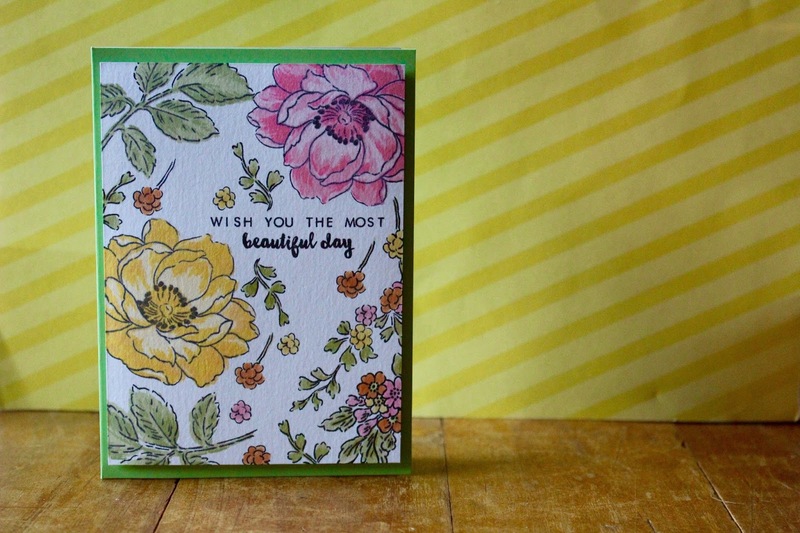 So for my card today I decided to use the Beautiful Day stamp set. So to begin the card I just used the Jet Black ink by Altenew to do all my outline stamping and the sentiment. 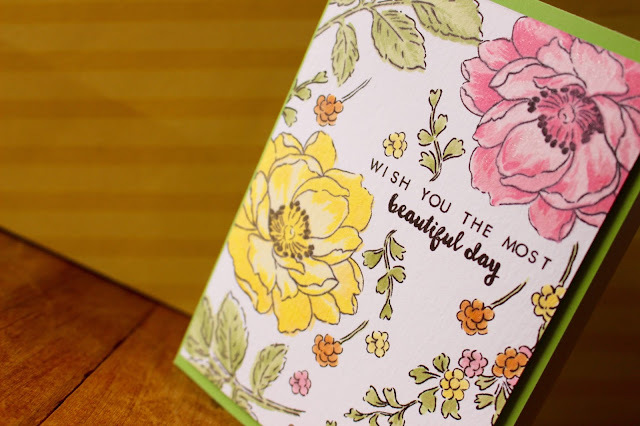 Once I stamped everything out I used some pink, yellow and green Altenew inks (all will be linked below) and stamped the two large flowers and the large leaves using the stamp layering stamps in the stamp set. For the other images, they don't have a coordinating stamp layering image, so I decided to water colour these images using the Altenew inks. To watercolour with these inks I just smoosh the pad onto an acrylic block, or any slick surface will work here. I then use a paint brush to pick up the colour and colour onto my image. So that's what I did for the rest of my images here. I just picked random colours and painted it on. I'm using watercolour paper here, so it works great. Once I finished water colouring the images I used my wink of stella glitter pen to add a little shimmer and then I adhered my panel onto some fun foam and adhered then the panel with fun foam onto a green card base from Hero Arts. That finished up my card.